LAKEPORT, Calif. — Tim Johnston is carving out a competitive niche on the bass club scene in the West. The proof is a third consecutive Montana state title won at the Old Milwaukee B.A.S.S. Nation Western Divisional. Johnston also won the tournament with an overall winning weight of 50 pounds, 14 ounces, edging runner-up Brent Shores by a slim margin of 10 ounces. What is remarkable about the win is Johnston did not catch a keeper bass during practice. He planned to follow a successful strategy of two years ago with the divisional held on Clear Lake. The plan involved flipping for spawning-phase bass in the tules along the shoreline. It was a bust. Going into a tournament without a game plan is a recipe for disaster on Clear Lake, known to produce 30-plus pound limits in a single day. As the final day of practice ended Johnston idled into a random shallow cove. There was nothing there to get excited about. Then, casts with a crankbait produced peculiar results. “I felt the lure striking baitfish with nearly every cast,” he said. Johnston ended the day believing the presence of baitfish could mean the same for the bass. The simple hunch proved correct. The Western Montana Bassmasters member made the cove his first stop on Day 1. It produced a limit weighing 15-13. Ironically, Kory Ray and Mark Torrez were at the cove entrance catching more bass. Johnston watched the two anglers catch nearly 60 pounds of bass from the spot. Torrez and Ray took the top two positions on the scoreboard. Johnston was unfazed. “This is an amazing fishery, and I thought if that one spot can produce such great weight that more fish would move in,” added Johnston. Johnston reasoned the fish were staging on the outside of the cove and then moving inside to feed on the massive school of bait. He returned to the spot for Day 2 and boated 17-3, eclipsed by the 20-pound limit of partner KC Stone. Indeed, the fish did move in to feed and more would come. Johnston, 50, and a B.A.S.S. Life Member since a teenager, sealed the win on Day 3 with a limit weighing 17-4. For all three days he fished with a Lucky Craft LV 500. The presentation was simply to cast the minnow-imitating lure into the school of baitfish. The action heated up as hungry schools of prespawn female bass moved into the cove to feed. Johnston’s state title comes with an invitation to the B.A.S.S. 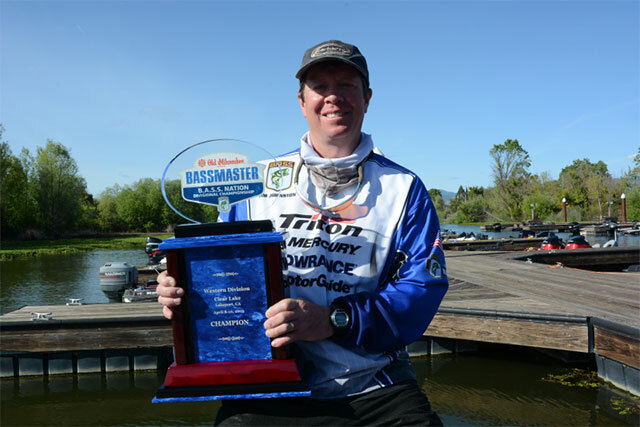 Nation Championship, set for next March on Grand Lake, Okla. Ten other anglers who caught the most cumulative weight on their teams will join him. The lineup includes Pat Hanning, Arizona; Steven Wilson, California; Larry Triplett, Colorado; Brent Shores, Idaho; Stephen Pike, Nevada; Robert Peixotto, New Mexico; Kory Ray, Oregon and Davick Hansen of Utah. The teams also competed against each other to win a $33,000 Triton/Mercury boat and motor package, based on highest cumulative weight for all of the team’s anglers. California won state bragging rights with 376-11. The event included a friendly competition between state championship high school teams from the region. Mentoring the youths and introducing them to a championship event was the goal. Julius Mazy and Thomas Sendek, Arizona’s high school representatives, won the event. The next divisional tournament is the Old Milwaukee B.A.S.S. Nation Southern Divisional on the Pee Dee River in South Carolina. The event is April 22-24. Stay tuned for Bassmaster.com for complete coverage.